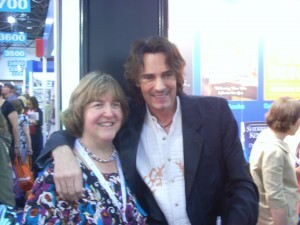 Ok — I confess — I went to BEA as a booklover and an author and got to sign my April book at the Harlequin booth and my May book at the RWA booth. I even got to meet one of my favorite authors and picked up an ARC of this upcoming book, THE EMPEROR’S TOMB, due out in November. And I got to meet two of my favorite tv personalities from MSNBC (no, not Keith Olbermann, darn!) — Mika Brzezinski and Joe Scarborough — who were there promoting Mika’s new book. But the highlight of the show…. Thanks to Liam R for taking and sending me the photo! So, that, and attending the Harlequin party (and meeting actress/author Kathy Kinney) and the Kensington party and getting a bunch of books and staying in a hotel called The Pod Hotel and finding an Irish pub named the Pig and the Whistle 2, all added to make my first BEA very memorable! PS — the honest to gosh best moment happened twice for me — in two different lines, waiting for someone else’s autograph, people recognized MY NAME and had read MY BOOKS! Huzzah for that — nothing better for an author to hear from a reader…..